Jim Stoppani, PhD, eats protein to build muscle and limits his carbs to stay lean. But that's just the beginning. 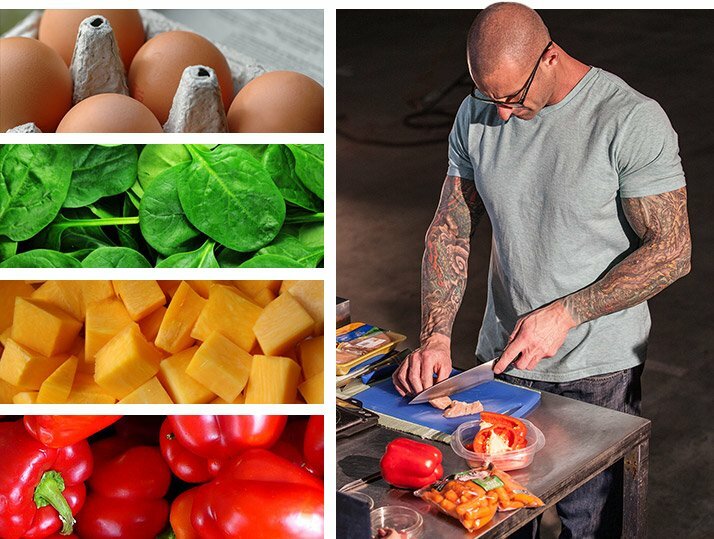 Here's his full nutrition philosophy and meal plan! Because there is always new research and information regarding physique building and fitness, Jim likes to test nutrition and supplementation variables on himself. Through his years of research and self-testing, Jim knows exactly which macros will produce the best results. Here's his nutrition regimen! "Overall, my nutrition philosophy is high protein," says Jim. "Muscle is made out of protein. In order to build muscle, you have to eat more protein. When you eat so much protein, you can eat fewer carbohydrates because the protein is also providing energy." Jim bases much of his diet plan from favorable research findings. For example: "Research has shown that people who eat whole eggs (at least three yolks per day) gain more muscle and strength than people who are eating just the whites." Jim also eats beef once per day for its muscle-building benefits and salmon for the uber-important omega-3 fatty acids. He's also a Greek yogurt fan: "It has high casein content, which is a slow-digesting protein. I like to mix a cup of Greek yogurt with a scoop of whey protein. It tastes like pudding, and you're getting fast-absorbing protein and slow-absorbing protein at the same time which helps extend your anabolic effect so you can build muscle better." As for carbs, "I give myself a high carb day once per week," he says, "which keeps my metabolic rate up and allows me to eat foods that I might be craving. It's a fairly consistent diet year round. I like to eat frequently; I get protein every few hours so I can avoid protein breakdown." Bodybuilding diets can be monotonous, so Jim finds creative ways to make food taste better. "I use a lot of fresh spices like garlic, basil, and things like that," he says.